The Q5 has long been one of Audi’s best-selling models in the US. And what’s not to like? It’s a respectable-looking and functional mid-size crossover, slotting in between the bite-size Q3 and the three-row Audi Q7. With a base MSRP of $42,475, the Q5 competes with stalwarts like the BMW X3, Lexus RX450, and Acura RDX, as well as upstarts like the Alfa Romeo Stelvio (look for our review soon). But the Q5 was getting a bit stale, as it hadn’t seen any substantive changes since its introduction in 2008. With the 2018 model, Audi has updated the Q5, making this a good time to check in with its workhorse. Gone is the old 2.0-liter, turbocharged, four-cylinder engine, replaced by a… 2.0-liter, turbocharged, four-cylinder engine. This year’s model offers 252hp and 273lb-ft of torque, an improvement on 2017’s 220hp and 258lb-ft of torque. That should get you from zero to 60mph in a smooth 5.8 seconds, a touch faster than last year. The all-wheel drive Q5 comes with a seven-speed, dual-clutch transmission. If you want more in the way of raw performance, there’s an SQ5 version with a turbocharged, 354hp V-6 and an eight-speed transmission for about $12,000 more. On the outside, the 2018 Q5 is an inch longer, two inches wider, and has a slightly longer wheelbase. The tweaks to the hood, grille, and sideview mirrors make for a more aerodynamic design. In terms of exterior design, the 2018 Q5 is evolutionary rather than revolutionary. 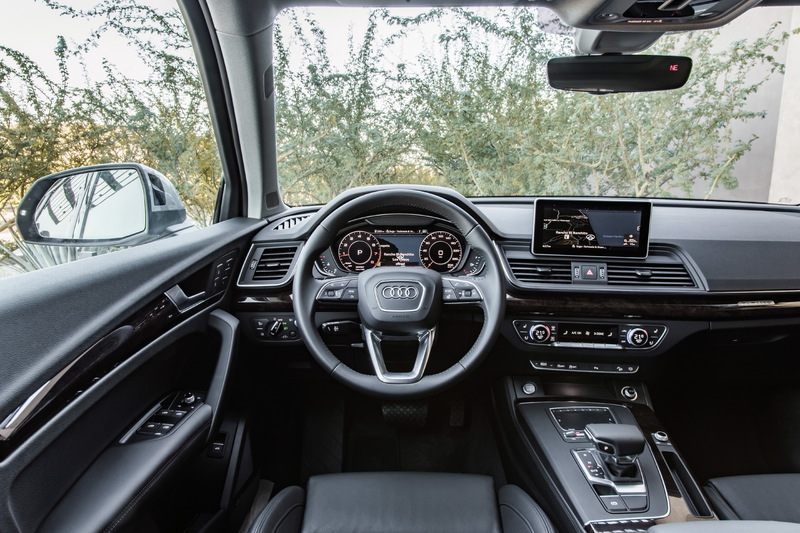 The Q5 interior has seen some upgrades as well, most notably the MMI infotainment system and instrument cluster. Both of those have been given the “retina treatment,” with the instrument cluster now consisting of a cleverly laid-out, smaller HD screen that can supplement or mirror the functions of the main 8.3-inch HD screen which protrudes unobtrusively from the middle of the dashboard. The climate control and drive select buttons are now touch-sensitive as well. 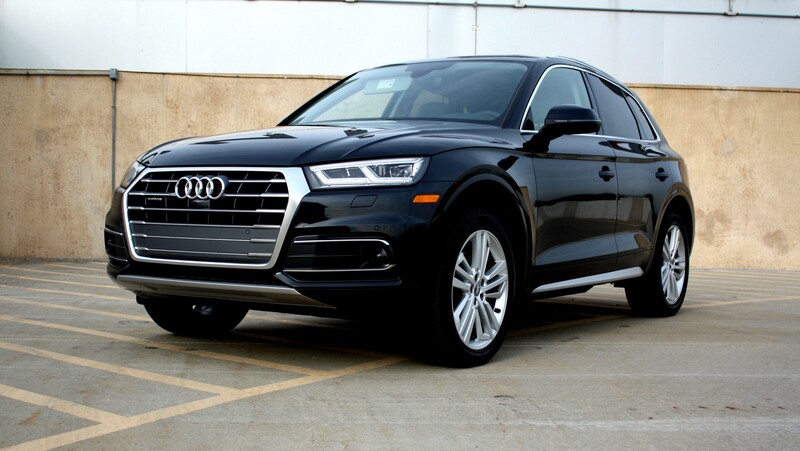 The Q5 I tested was tricked out with Audi’s Prestige package. This includes 20-inch wheels instead of the usual 18-inchers, LED headlights, touch-sensitive MMI interface, adaptive cruise control, a top-view camera system, and more. With all of the included options, this one would retail for $56,100. Audi rates the Q5’s mileage at 25mpg (23 city, 27 highway); I saw just over 27 on the highway and in the 22.5-23.5 range for city driving. Let’s start with the interior. Trimmed out with the finishes you’d expect in a $50,000 car, the cockpit is now on par with that of the Q7, and it is a very comfortable place to spend time in. I don’t want to wax too much on Audi’s outstanding MMI system; Jonathan Gitlin covered it in his review of the 2016 Audi TT, and Ron Amadeo went into even more depth in his infotainment feature. You should definitely read those articles if you want a more detailed look at it—the MMI is a truly fantastic piece of technology. Much of the MMI’s excellence comes from its interface. You interact with the main MMI display via a large knob, four buttons, and what looks like a trackpad. Taken together, they make fiddling with the radio, entering an address, or tweaking other settings very simple. You can even write the first letters of an address or city on the touchpad when using GPS navigation. The 12.3-inch HD display that takes the place of the usual instrument panel is also a pleasure to use. It has a tabbed interface with steering wheel controls that allows the driver to interact with the GPS, change radio stations, make a phone call, and see the usual mileage and fuel economy statistics. The two screens work together for a tightly integrated infotainment experience. The Q5’s interior is well-trimmed. The front seats are comfortable and come with adjustable lumbar support. There’s plenty of headroom, even with the panoramic moonroof, and two adults can sit comfortably in the adjustable backseats, which have their own climate controls. You can fold down the three seats independently, when needed, for 60+ cubic feet of cargo space. With the seats up, you have an adequate 26.8 cubic feet of space, accessible via the standard power liftgate. That middle seat is going to be bad news for any normal-sized adult, however. Included in the Prestige trim is a heads-up display. It shows your current speed, the local speed limit, and indicates whether lane-assist is active. If you’re using the GPS, you’ll also see navigation prompts. Should you find the heads-up display too distracting, you can turn it off, but it’s useful for keeping your eyes on the road instead of flitting about the cabin. I began driving the Q5 the day after wrapping up a week with the new Alfa Romeo Stelvio, and the contrast between the two vehicles couldn’t be more pronounced. You’ll be able to read—and watch—my take on that SUV next week, but briefly, the times when the Stelvio felt like a performance sedan in the body of a crossover—giving me a strong sense of connection with the road—the Q5 felt like it distanced me from what was going on around me. And that’s not entirely a bad thing. I spent most of my time behind the Q5 with the drive set on comfort or dynamic (you can also select offroad, allroad, efficiency, or auto). My daily driver is a 2008 Audi TT, which I love in part because of the powerful connection I feel with the road when I’m behind the wheel. In contrast, the Q5 made me feel insulated from the road, but in a good way. Let’s start with road noise—it’s largely absent when you’re in a Q5, regardless of speed or traffic. The Q5 is so quiet, I suspected Audi of using noise-cancellation to mask driving sounds. Instead, it’s the windows and insulation that make for a quiet ride. The 2.0-liter turbocharged engine always has enough for whatever is asked of it, although I felt a brief hesitation before the turbo kicked in once or twice. That said, the engine responds when summoned, even if it’s not nearly as quick as that of the Stelvio. On winding country roads, the high driving position was a reminder that I wasn’t in a roadster and that I should lay back a little bit in the curves. But when I did push a little, I felt fairly locked onto the pavement, without any real top-heavy feeling. Audi has been one of the automakers at the forefront of assisted driving, and the Q5 I tested came loaded with the tech. Adaptive cruise control worked extremely well, keeping pace with the car in front of me even in slow-and-go traffic. You can manually adjust your following distance via the MMI, which is useful. Lane assist kicks on once you’re in the neighborhood of 35mph. Once the lane indicators in the heads-up display turn green, you’re in business. Like other vehicles, Audi’s system can struggle with faded lane markings, especially on very bright days. But when engaged, it will detect when you’re drifting into another lane and steer back towards the center. Feeling the steering wheel move under my hand was a little unsettling the first time it happened, and if the Q5 needs to do two or three corrections in a short period of time, it will politely remind you to keep your hands on the wheel. But it works very well, leading to that feeling of disengagement that I occasionally ran into while driving the Audi. Last on the driver-assist list are three yellow lights on the sideview mirrors that flash when a car is in your blind spot. It’s not just the lack of road or engine noise that makes piloting the Q5 a calming experience. The posh interior, quiet ride, and technological sophistication synchronized to make the days I spent behind the wheel of the Q5 rewarding ones. The Q5 doesn’t offer an exhilarating ride—the Stelvio is as close as I’ve come to that feeling behind the wheel of a crossover—but it’s an immensely satisfying ride. The crossover market is crowded, and if you’ve got $45,000 to $60,000 to spend, picking which crossover is right for you is going to be tough. Where Audi sets itself apart from the competition is the instrument panel and infotainment system. The only other manufacturer that comes close is Volvo, and both Audi and Volvo stand head and shoulders above the crowd. In some ways, that was the hardest thing about watching the Q5 drive away from my house—knowing that I was returning to a world of fiddly infotainment systems. Audi’s cockpit ergonomics are also fantastic. Everything is within easy reach, and the learning curve is a shallow one. You’re not going to need to spend hours leafing through the owner’s manual to figure out how everything works. Five to 10 minutes in your garage messing around and you’ll be the master of your crossover domain. If you value technological sophistication, smart design, and plush ride above all else, then the Q5 is the car for you. While you may not feel as connected to the pavement as you would in something sportier, like a Stelvio, you’re going to feel like the king of the road, moving in a serene and stately fashion from point A to point B. And that’s not a bad way to go. The post A sea of calm behind the wheel: The 2018 Audi Q5, reviewed appeared first on News Wire Now.